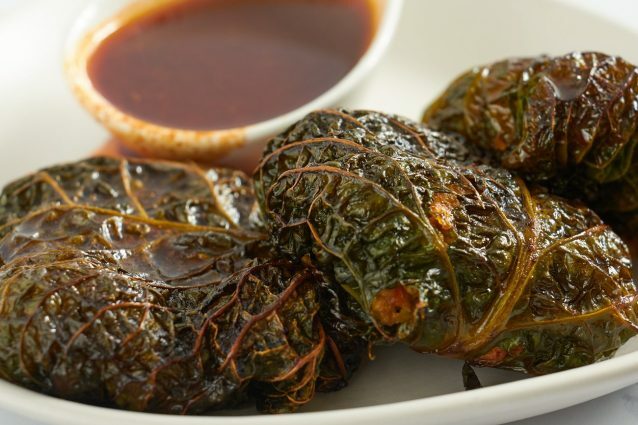 These tasty cabbage rolls are a cross between pork-fried rice and Chinese-style lettuce wraps. The filling is cooked, ground pork with a selection of vegetables, and cauliflower rice instead of traditional rice. The cauli rice means it’s suitable for those who don’t want to include rice in their diet, and this also means it’s lower in calories. 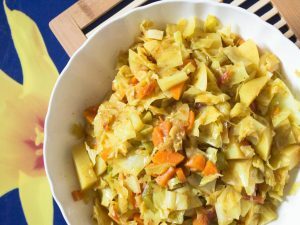 The cabbage parcels can be eaten hot or cold with the dipping sauce, and if you make a large batch of them at the weekend, you can take cold ones with you for a packed lunch. The cabbage leaves make the perfect edible wrap packet to hold the ingredients once cold, so they’re great for food on the go. Preheat the oven to 160C fan/350F/gas mark 4, and lightly grease an 11 x 7-inch baking dish. Cut the end off of the cabbage and peel away approximately 8 to 10 leaves. Run a knife down the flat part of each leaf to thin out the stem and cut away the end part if it is quite thick. This will make the leaf more pliable. Once the meat is fully cooked through, add in the cauliflower rice, coconut aminos or soy sauce, fish sauce, spring onions and carrot. Let everything cook for about 5 minutes before cracking in the 2 eggs and stirring well to ensure that everything is well mixed. Remove the skillet from the heat and allow to cool slightly. Blanch the cabbage leaves by dipping them into boiling water and removing them to drain on paper towels. This makes the leaves much easier to handle and fold. Place 2 to 3 spoonfuls of the pork mixture into the center of each cabbage leaf. Roll them up like a burrito, folding in the two sides over the center and then rolling the other ends over top. Place the cabbage rolls seam side down in the baking dish. Once you have finished rolling all of the rolls, place a sheet of aluminium foil over the dish and bake it in the oven for 30 minutes*. After 30 minutes of baking, remove the tin foil from the top of the dish, brush each roll with some of the sauce and return to the oven to bake for another 15 minutes until the rolls turn golden brown in colour. Sprinkle the rolls with sesame seeds if using, and serve alongside the sauce for dipping. 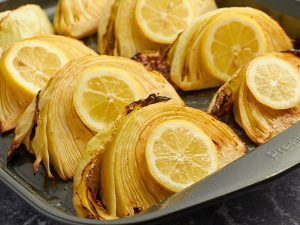 * Don’t forget to cover the cabbage rolls with foil before putting in the oven, as cabbage leaves burn very quickly when uncovered. 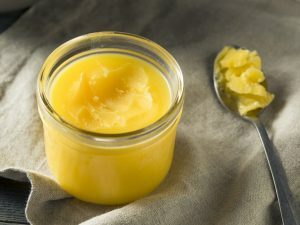 * The eggs are used as a binding agent, but if you prefer not to eat eggs, you can leave them out, although the filling won’t stick together quite as well.